So our next stop on the blog tour was over with Shaz. I was delighted to have Emma Crowley do the honours here and she was good enough to read and review Secrets We Keep – I think she liked it!! Emma wrote a lovely review and my thanks both to her and to Shaz for featuring on the tour! And here’s the post in it’s entirety!! Secrets We Keep is the second novel from Faith Hogan and although I hadn’t read her first I know now I will have to rectify that. This book was wonderfully written evoking such a feeling of time and place that you couldn’t but fail to be caught up in the lives of Kate and Iris as they battle with a myriad of emotions and situations placed upon them for various reasons. The brief prologue shows us Kate as a young girl in Dublin. It is 1988 and her parents are at a crossroads in their marriage. Both her mum and her dad wrestle with their own demons as Kate becomes like an observer in the family rather than a child. She is almost forgotten about. We then move forward to the present day and Kate has become a high flying divorce lawyer. She is very successful in her job and has built up quite a reputation for celebrity divorces and what she can achieve for people. But Kate is restless, there is forever something lingering at the back of her mind and this weight is present for the majority of the book. As is typical in many women’s fiction books Kate needs a change and she needs it now otherwise she may continue to remain the way she feels stuck in this moment forever. A visit at the end of the year to Ballytokeep on the west coast of Ireland helps her firm up her decision as she falls in love with an abandoned bath house owned by her relatives Iris and Archie. This sets in motion a chain of events for all concerned which could be for the good in the long term but at the same time distress may ensue in the present. The author mentions Ballytokeep as a place to lose yourself in and I would say that is how I felt about this book the more I read. The words just had such a lovely flow to it and seemed to wash over me as I became absorbed in the story. Faith Hogan writes so well of the setting of Ballytokeep nestled on the Irish coastline exposed to all the elements the Atlantic Ocean throws at it yet at the same time small though it may be it is a warm and inviting place. People can be nurtured and protected and cocooned in the special atmosphere that pervaded throughout the story. But it is also a place where things kept hidden and buried for many years must now come into the open now Kate has arrived. With Kate re-opening the bath house after it being under lock and key for sixty years it’s not only Kate that will have to confront things she really wants buried away at the back of her mind. Running concurrently throughout the book are two stories told in the present and in the past and only as we venture towards the end of the book do they begin to link and threads the reader had been grasping at slowly begin to weave themselves together. In the past we learn of Iris’s story and I will admit there was a tentative connection I could see merging the past with the present and I was delighted to be proven correct yet in no way did it detract from the overall storyline instead when it was revealed it brought a satisfactory smile to my face. I love books where the past and present collide and alternative chapters are told from two characters viewpoints. In this case it was that of Kate and Iris. Sometimes I find I would be reading along enjoying the more modern aspect of the story and then suddenly we are abruptly jolted back to the past and it leaves me confused and unsettled. Not so in this case I felt everything mixed together seamlessly and both aspects of the storyline were as intriguing and enjoyable as each other. Iris grew up in a guest house with her sister Pamela and mother Maureen. She is now at the age where she feels will this be all her life has to offer especially as Pamela is about to marry her fiancée Sir Clive. She has her head turned by a William Keynes and irrevocably her life is changed forever. Iris both in the past, and the present where she runs a hotel in BallytoKeep with husband Archie, was just such a wonderful character. I felt she was so wise, loving, caring and astute. She picked up on things others didn’t yet never forced her opinions on other people. We do discover quite early on one of the things that is playing on her mind and has been for some time but there were still a few curve balls to be thrown in. I felt so sorry for her with the situation she found herself in but this almost took a back seat as the story of how she and Archie met and came to run the hotel with the mention of another character became so fascinating. I found myself racing through the modern day sections to uncover the mystery of the past and the rising sense of tension was crafted to perfection as it felt things were building to a dramatic conclusion when revelations would come to the fore. I only wished Iris and I suppose Kate but maybe less so for me would find the peace they were clearly struggling to locate. I say less so Kate because I preferred Iris as a character not that Kate wasn’t well written I just identified with Iris more. The relationship between Iris and Archie in the present was loving yet in equal measure heartbreaking to observe at what was sneaking it’s way in. It really touched a cord with me and brought a tear to my eye. It was sensitively handled and deftly slipped in at just the right moments with no major issue made of it yet at the same time you knew it was present and making it’s slow destructive mark felt. Normally in a story with a dual timeline I would prefer the past over the present or vice versa but in Secrets We Keep both were as strong as each other even if there were a few characters in the modern day who didn’t do much for me at all. I enjoyed reading of how Kate bit by bit slowly began to emerge just that little bit stronger as she brings the bath house back to life with the reopening of the tea rooms. Her new found friend and side kick Rita Delaney was an excellent addition to the story. She provided humour with her sharp witty, dialogue and take on things and I was glad to see her get her own storyline where revenge is a dish best served cold. Kate begins to feel a natural affinity with her new home but her own past does begin to make itself present. I didn’t like the character connected to this aspect of her life. I understood the problems said character had but really I found them to be selfish and self absorbed and propped up by too many other people. This person had been causing damage for far too long and really did need a kick to come out from under the dark cloud they enforced around themselves. I can’t say I was overly happy with the outcome regarding this situation as I had been hoping for the alternative resolution but that’s just my own personal opinion and many other people’s views will vary. Ballytokeep is a place to heal, to forgive and forget, to find resolution and acceptance. None of these things are easy for anyone in any aspect of their lives but within this story Faith Hogan has achieved this through beautiful writing with characters the reader feels a close affinity to which is difficult to achieve the entire way through a novel. Again as with a couple of recent books I have read I was surprised by how much I enjoyed this novel. Behind the beautiful,light,summery cover is story that is much deeper than one would expect. There is much for every reader to take from this story and it demonstrated to me that Faith Hogan is a gifted writer with huge potential I just hope her writing reaches the wide audience it deserves. I look forward to reading more of her work in the future and would highly recommend Secrets We Keep. In the mean time to keep me going I will certainly be searching out her debut My Husband’s Wives. 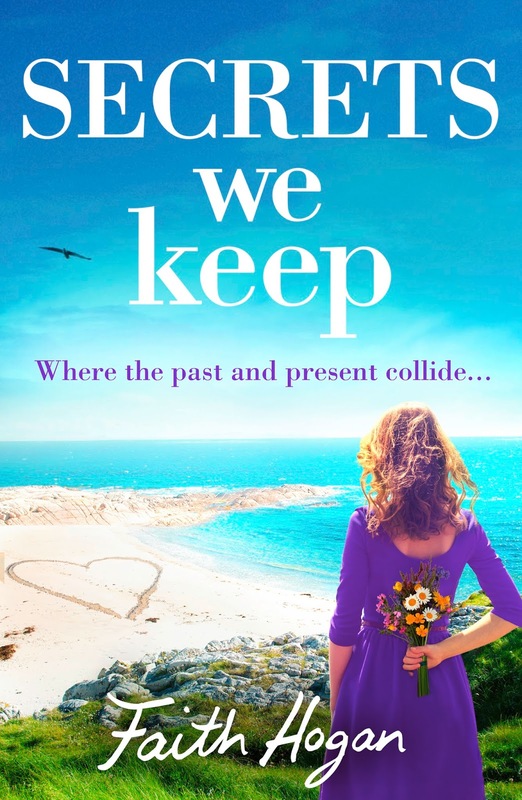 Many thanks to Aria via NetGalley for my copy of Secrets We Keep to review and to Sharon for having my review on the blog.